As an onco-nephrologist, I see patients with kidney dysfunction, hypertension and electrolyte disorders caused by cancer or cancer therapies. Onco-nephrology is a newer but growing specialty. Kidney function is a complex interaction of medications, underlying medical conditions and dietary habits. When a patient is fighting cancer, this interaction becomes even more complex. Maintaining healthy kidney function is essential in order to receive lifesaving cancer treatments. I provide all my patients with individualized care to ensure that kidney injuries can be identified early and reversed so that cancer treatments can continue. Unfortunately, cancer patients who have renal dysfunction are excluded from most clinical trials. It is estimated that almost one third of cancer patients have some degree of renal dysfunction. I am very passionate about helping these patients overcome their kidney conditions so that they can focus on their fight against cancer. 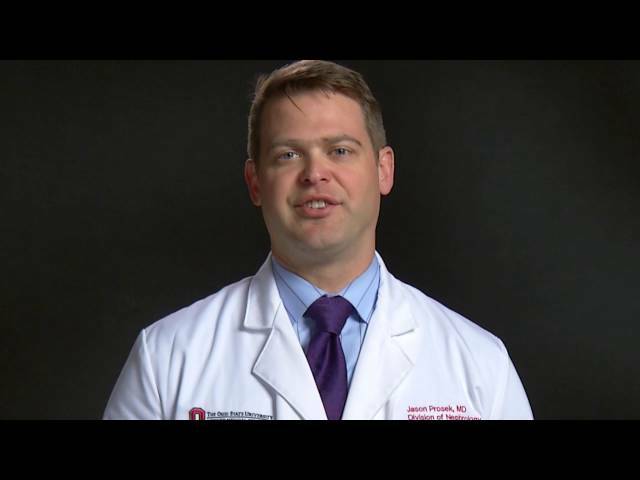 When I proposed initiating an onco-nephrology clinic here at Ohio State, I was granted all the help, clinic space and resources within a week. It’s this rapid response and devotion to patient care that makes me proud to work at an institution like Ohio State. When I’m not working I enjoy traveling, reading and fitness. I’m also a season ticket holder for the Columbus Blue Jackets and the Columbus Crew. He listens very well - is concerned about my situation at home. Love Dr. P. is the best ever! Dr. Jason Prosek is A-1 - bright young physician - has my interest at hand. Excellent. I appreciate that Dr. Proseck takes the time to really listen and explain things thoroughly. As of 12/20/2018, Dr. Prosek has reported no relationships with companies or entities.